OUR SUNDAY SERVICE is at 10.30am each week. The service is either Sung Eucharist, (Book of Common Prayer or Common Worship), Family Communion, or Choral Mattins. Occasionally there is Choral Evensong at 6.30pm. SPECIAL SERVICES are held during the year - Toy Offering Service; Christmas Carol Service; Christingle and Midnight Eucharist on Christmas Eve; Christmas Day Eucharist; Ash Wednesday; Maundy Thursday; Good Friday; Easter Vigil; Ascension Day; Harvest Festival and All Souls. HOLY BAPTISMS may be held on a Sunday afternoon or occasionally at a Baptism Eucharist at the Sunday morning service. Please contact the clergy to arrange for Holy Baptism. FUNERALS for parishioners and those with connections within the parish, may be held in church, followed by burial in the Churchyard or cremation. If required, the clergy are happy to conduct the full service at a local crematorium. 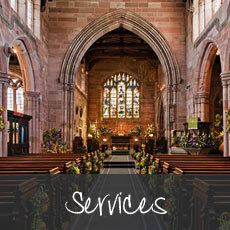 Arrangements for funerals may be made directly with the clergy, or with a local funeral director (see Links page), who will then consult the clergy to arrange a visit to the family as soon as possible to discuss the service and music. MEMORIALS. Stones or cremation tablets may be placed in the Churchyard, or an additional inscription on an existing family gravestone. The Stonemason will apply to the clergy, to ensure that materials, design and wording of memorials conform to diocesan churchyard regulations. It is strongly advised that at least six months should elapse after a burial before a memorial is placed on a grave to allow for settlement of the ground. For further information about current services see below. Other Church/Parish events are described in the Parish News pages. We now have available gluten free wafers available at Holy Communion. If this would be a help for you, please let the clergy know before the service.